awaiting, as I once said on another occasion “hot buttered crumpets to come”. They belong to a tradition as English as that comestible yet are of as universal appeal as are such age-old favourites as 'Stonecracker John', 'Sea Fever' and 'Five Eyes'. The disc is titled 'Songs Discovered' and while the majority of the poets may be 'kent faces' the songs are indeed 'discoveries' and are in fact world premiere recordings! This, for me, has thrown up some rare, unmissable experiences. While all seventeen songs have an obvious unity there is a great variety of stylistic expression. These range from the simple love-song of Winifred Bury: about whom seemingly nothing is known! To the subtly conventional Thomas Dunhill. Then there's Ian Venables' evocative treatment of the enigmatic Sitwellian imagery of Marion Angus's 'The Court of the Poisoned Rose'. Not to mention the Gilbert & Sullivan-esque whimsy of 'Swinging on a Birch Tree' with its exciting accompaniment. It is also surprising to find not one but two unrecorded songs of Gurney - although neither seems to me particularly characteristic. There are also darknesses in the mysterious world of de la Mare - and the Searle 'I hear an army marching' transcends the prevailing mood. The whole conception is a generous Maeceanas-like effort on the part of Dr David Wright, composer and musicologist from the Isle of Wight - and here participating with two cheerful carols written in his schooldays. He has personally covered three-quarters of the cost 'pour encourager les autres'. I wish him success. 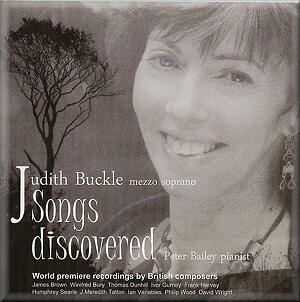 The technically assured and expressive voice of Judith Buckle, despite her involvement since the 1970s with oratorio, opera and theatrical work, is also a 'discovery', her enunciation bright and clear. This helps to overcome the absence of poetic text. The pianist, Peter Bailey, equally technically assured, is as fine an accompanist as I have ever heard. In the later pieces on the disc, in particular the songs of Ian Venables, he is truly a partner and not simply an accompanist. The recording itself is crisp, the balance excellent - a very fine disc indeed.